The idea behind the Red Hook web pages is to get a snap shot view of Red Hook, Brooklyn in the late 1800s. The main focus is on the area south of Hamilton and west of Richards to the water. This page is a look at local celebrities. Perhaps the most famous celebrities in Red Hook were members of the Crehan family. Thomas Crehan born in Ireland circa 1820 married Harriet O'Neill born in Ireland circa 1822. The Crehans and their six children came from County Limerick to Brooklyn circa 1865. Ada - Delia (AKA Ada) (1857) AKA Ada Rehan. Delia is a nickname for Bridget. Arthur (c. 1860) died 1900. AKA Arthur Rehan. All three daughters became stage actresses. Two of them married actors. Two of their children in turn became actors. None of the sons married. Thomas and Hattie Crehan settled at 165 Partition (later Coffey) street and raised their children. 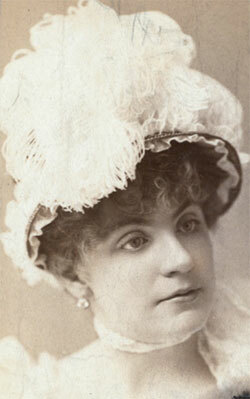 Ada C Rehan (Delia) became a famous stage actress who performed all over the US and in Europe. She portrayed "Shakespearean heroines and other classical characters" (BE, 1901) and was described as one of the finest actresses of the time. She was the leading lady in the Augustin Daly company. Her greatest role was Katherine in Taming of the Shrew. She was born Delia Crehan in County Limerick, Ireland and came with her family to the US as a small child. She gave her final New York performance in 1905. Ada was a friend of Lillian Russell. 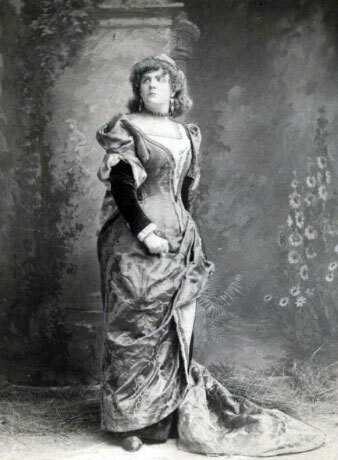 Ada appeared in over 120 roles between 1874 and 1898. Ada's older sister, Kate, was also an actress who married the actor Oliver Doud Byron. Their son Arthur Byron was also an actor. Another sister, Harriet, was an actress under the name Hattie Russell. Mary Kate and Hattie had started a chorus girls known as the O'Neill sisters. Eventually they graduated to speaking parts. According to the Obituary of Harriet O'Neill Crehan. Kate and Hattie made their stage debut in 1867 as the Misses O'Neill, singing in the choruses of "Leah, the Forsaken" the first successful play written and produced by Augustin Daly and performed at Neblo's Garden. 1870: Brooklyn Ward 12, Kings, New York Thomas Crehan	50, ship carpenter, Hariett Crehan	48, William Crehan	25, ships carpenter, Hariett Crehan	20, actress, Delia Crehan	13, at school, Arthur Crehan	10, Mary Burke	50, Oliver Byron	27, actor born Maryland, Mary Byron	22, actress, all born Ireland except Oliver Byron, married in November. 1890: Death of Thomas Crehan, age 71, born Limerick Ireland, of heart disease. He had lived in Red Hook for many years. 1898: The Crehan clan met at Partition street for Christmas: Mrs. "Henrietta" Chrehan and her five children, Ada Rehan, Hattie Russel, Mrs Oliver Doud Byron, Arthur Rehan and William Crehan were joined by Oliver Doud Byron, Futlon Russell, Arthur W. Byron and the long time family retainer, Mary Burke. 1900: May 28, Arthur Crehan, the brother of Ada Rehan who had also adopted the stage name Rehan died at the home of his mother, Harriet Crehan 165 Partition of hemorrhage of the lungs*. It was reported that he had only been sick for a week and that he had been "in failing health some months". He was born in Limerick, Ireland, circa 1862 and had lived in Brooklyn for 30 years. He was a manager for his sister's husband the actor Oliver Doud Byron. His siblings were at his bedside when he died. Buried Greenwood. *Most likely a complication of TB which was very common at the time. However it is possible, given that Arthur was said to have been sick for a short time, that Arthur suffered from some rare blood vessel problems. ARTHUR REHAN DEAD; Young Theatrical Manager Succumbs to Hemorrhage of the Lungs. Arthur Crehan, better known as Arthur Rehan, the youngest brother of Miss Ada Rehan, died at the home of his mother, 165 Partition Street, Brooklyn, yesterday morning from hemorrhage of the lungs. He had been ill only a week, and his restoration to good health was confidently looked for by his family up to Friday afternoon, when his illness took a sudden turn for the worse." He was said to have been managed many of Augustin Daly's attractions when they were on tour. 1900: 164 West 93rd street Manhattan, Ada Rehan, born Ireland imm 1854, actress, and a servant. William, the eldest lived with his mother, had a fine tenor voice, did some local solo performances and traveled as a representative for his sister and her hudband, the Bryons. Thomas had died several years before. Kate, Mrs. Oliver Doud Byron was a well known stage favorite, but had retired with her husband to Long Branch, N. J.
Hattie (Mrs. Russell) was also a a well known stage actress who married Fulton Russell a leading man in the John Drew company. Ada (Delia). The most famous of the siblings. Arthur the youngest who died in 1900 at age 38 had started as an actor and subsequently moved as a manager to the front of the house. 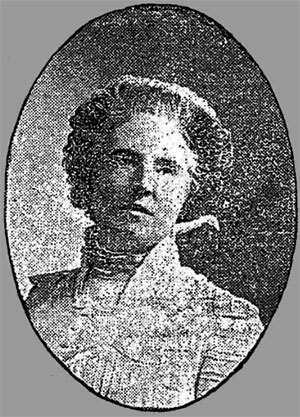 1901: Death of Harriet O'Neill Crehan - January 15, 1901, bronchitis. William who lived with his mother and was a good singer but did not adopt the profession of his siblings. However, he sometimes traveled as a business agent for Mr. and Mrs. Olive Doud Byron. Thomas who had been dead "some years". Authur who died "not long ago"
Mary Kate Byron of Long Branch, NJ. Harriet O'Neil was one of the "brightest girls in the county of Limerick" who could sing and dance with the best of them. The Crehans were supportive and encouraging when their daughters expressed a desire to become actresses. 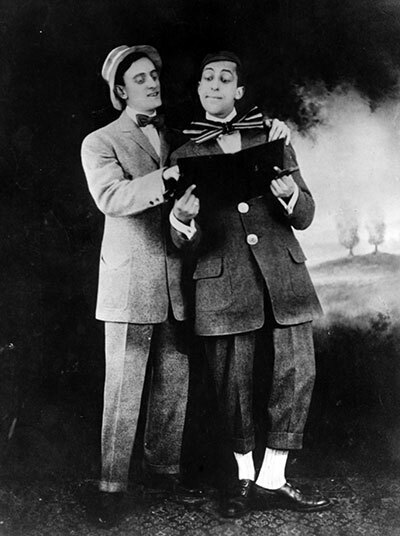 Two grandsons were also actors, Arthur W. Byron was a member of the John Drew company and Fulton Russell who was in the cast of Nell Gwyne at the Knickerbocker Theatre. There was one great grandchild, Byron Fulton Russell age 2 and a half. Mary Burke age 86 was acknowledged as a domestic who had been with the Crehan family for 58 years. "The illness of Miss Ada Rehan and the suden death of her mother, Mrs. "Henrietta" Crehan, at her home in Brooklyn, caused the management to close the Knickerbocker Theatre last night." Wednesday 16, January 19901. The theatre remained dark until Friday. 1901: Mrs. Harriet Crehan of 163 "Coofeey" street, who died Jan 15, 1901 designated her son, William as her sole beneficiary. Relatives named in the will were: Ada Rehan, Harriett Russel, Mary Kate Byron and William Crehan. Value of the estate - $4,500. 165 Partition (later Coffey) is on the south side of the street between Conover and Van Ferris. There are tons of images of Ada Rehan on the internet. See Library of Congress for a handful. Ada Rehan lived in a luxurious flat that she owned at 194 W 93d street. Wilson Barrett was discussing Ada Rehan a short time ago. Said he: "I have never seen anybody like her. I consider her a genius. It is so easy to detect, in the refinement of her work, the advantages of birth and education." That is exactly where Mr. Barrett and a great many others fall into grave error. Miss Rehan is a self-educated woman. She was born in Limerick, Ireland, and came to this country when very young, making her first appearance on the stage at the age of fifteen. Among her principal successes are roles in "SevenTwenty-Eight," "Needles and Pins," "The Country Girl," "The Squire," "Love on Crutches," "Nancy and Company," "The Taming of the Shrew," "The Merry Wives of Windsor," and " As You Like It." She visited her mother in Brooklyn every Sunday. She appeared in the Arch Street theatre in Philadelphia in 1874 under the direction of Mrs. John Drew. In 1896 the New York Times said Ada Rehan "is now regarded as the foremost actress of the American stage". Hattie married R. Fulton Russell [Richard Fulton Russell] who was a leading man with the Drew company. They were the parents of Fulton Russell born 1878 who also became an actor and who died March 24, 1917. Hattie played with Lillie Langtry at Fifth Avenue Theater circa 1890. In 1889 Lilly Langtry visited her in Long Branch, N. J.
Hattie died in Long Branch New Jersey on August 12, 1918. She left over $100,000 in her estate. Here sister, Ada left nearly half of her $221,703.20 estate to Hattie when she died in 1916. She also used the stage named Hattie O'Neil. 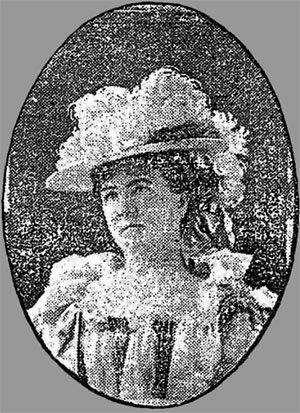 She had toured the United States with her brother-in-law Oliver Doud Byron and the Augustin Daly Co. She had appeared in Niblo's garden in Leah the Forsake in 1901. Fulton Russell was in the cast of the Knickerbocker Theatre in 1900. R. Fulton Russel died in 1925. Hattie's last stage appearance was in "Paid in Full" in 1914. 1925: Death of R. Fulton Russell senior- Probate index of R. Fulton Russell, July 7, 1925, New York, petitioner, Byron F Russel grandson of the deceased, Long Branch N.J.
1905: January 4, Belle Constance Russell sued for divorce against Richard Fulton Russel an actor in Rehan's company in St. Louis. 1917: Fulton Russell died March 24, 1917. 1948: July 21, Mrs. Isabelle Constance Russell LONG BRANCH. - Mrs, Isabelle Constance Russell, 74, widow of Richard Fulton Russell, died this morning at her home. Married in 1869 to Oliver Doud Bryon. They had one son, Arthur Byron born 1872 who became an actor. Members of the Long Branch acting community the Bryons and Russels were mentioned along with Mrs. Georgie Drew Barrymore and Mrs John Drew were quests of Oliver Doud Byron. The Bryon's cottage at Long Branch was called Patches. Their son Arthur W Byron was a well known actor and a member of the Drew company. When Hattie (Mrs. Russell) died in 1918 at the summer home of her sister, Mrs. Oliver Doud Byron in Long Branch, NJ, here estate was expected to exceed $100,000. "William" Crehan - Ada Rehan's father - BDE - His name was actually Thomas, although he is listed as William by several newspaper articles. 1915: Heroines of the modern stage By Forrest Izard incudes a whole chapter on the Crehan family. The family came to the US from Ireland in 1865. The parents were William Crehan and Harriett O'Neill. There were six children: three boys and three girls. None of the family had ever been on the stage. The older sisters, Kate and Hattie, proceeded Ada to the stage but never attained the reputation that came to their youngest sister. Two of the brothers, William and Artur, also became involved with the theater. 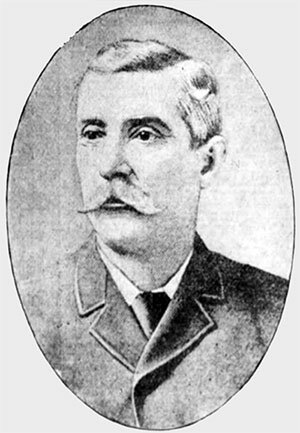 Henry E Buermeyer was a founding member of the New York Athletics club in 1868. Henry E Buermeyer was born August 13, 1839 in a house at Broad and Market street in New York City to Ernest and Louise Buermeyer German immigrants. He attended school until he was sixteen at which point he hired himself to a blacksmith for two years with the idea that it would build up his strength. He took up boxing and became a champion amateur boxer. At 22 he joined the Union Army where he served for three years and was wounded in the left foot in the battle of Antitam and in the right leg at the battle of the Wilderness. He received a war pension. In 1866 his parents moved to Brooklyn and he went with them. Ernst Buermeyer owned property in Red Hook. The family lived at 130 Van Dyke. Henry Buermeyer married Mary A Carroll in 1876. They did not have children. Henry and his wife, Mary, moved to 261 Sackett street. Later they moved to the St. George Hotel. After his move to Brooklyn, Henry trained on the docks of the Erie Basin before and after work. Henry was in the warehouse business in Manhattan until around 1905. 1870: under "Boermeyer": Ward 12 Brooklyn "509" no street entered, Ernest, 59, retired hotel kkper, $45,000 $6,000 Hanover, Louisa 53 Hanover, Henry 32 glass merchant, Ferdinand 24 student for church*, Charles 18, clerk in brokers all born New York one servant. 1878: Ernst Buermeyer 130 VanDyke. 1887: Household furnishings, Buermeyer, F. F. 130 Van dyke .... f. G. Smith piano. 1904: Henry E Buermeyer et al to Henrietta Kahn. nom Sackett st, n s, 111 e Clinton st, 21x100. Emma R and Herbert A Buermeyer by Phebe H Buermeyer guardian to Henrietta Kahn. 1905, 1910, 1915, and 1920 he and his wife, Mary were living in the St. George Hotel in Brooklyn. 1922: Death of Henry Buermeyer, 10 October 1922, at the Skene Hospital Brooklyn, age 84, probate, petitioner Mary A. F. Buermeyer wife, niece Meta Buermeyer and nephew Ferdinand W. Buermeyer. Ferdinand Buermeyer was the son of Henry's brother, Charles. Lots of pictures of Henry Buermeyer on the internet. Ferdinand Buermeyer became a Lutheran Minister. He was pastor at the Evangelical Church of the Epiphany 74 East 128th Street in 1890. He was at Grace Lutheran in Shillington circa 1902. M. Elliot Burris on the extreme left was one of the NYAC's champions at the running high jump and the quarter mile and 100 yard runs. He was retired form the club by 1884. George I Brown was "another fine runner" and a member of the NYAC who in 1873 won the half mile run. He was also a member of the four man oar in 1875. Dan M. Stern pictured with his had on Buermeyer's knee won the one mile walk in 1876. He set a record that was still unbroken in 1893. He was the first to do seven minutes for a one mile walk. Charles H. Cone standing between Stern and Buernmeyer was a champion 100 yard swimmer and stroke oar on the four man crew. The four man crew with Charles Cone won the championship in the Harlem River June 26, 1876. 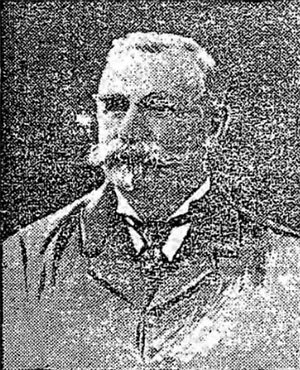 William B Curtis was a founding member of the club. Notice the difference in shoes. 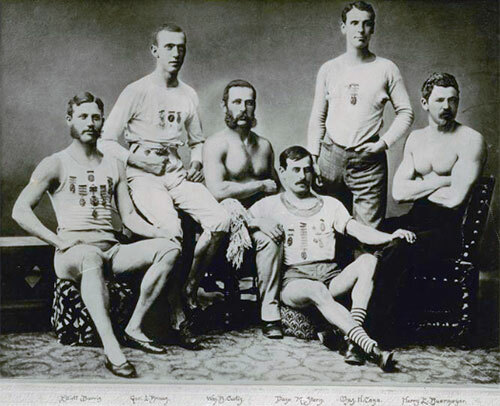 "One of the prizes of the collection is a portrait of the club's team of 1873 which consisted of six men, and composed of athletes who did not specialize in view of the fact that aside from Dan Stern, the walker of the sextet, each of the men was an adept at from half a dozen different events upward. This team was make up of W. B. Curtis, Harry E. Buermeyer, George I Brown, Elliot M Burris, Dan Stern and Charles H Cone, and said to have been a credit to the amateurism of its time." There are a lot of images of him and his paintings on the Internet. John Charles Lewis was born August 13, 1880 according to his WWI Draft registration which listed him as a vaudeville manager. In a bio of Who's Who in Vaudeville it was said he was born in Red Hook Point. He was a vaudeville comedian who teamed up with Ed Wynn in 1902 in a routine called "Win and Lose" - an act which satirized the foibles of college boys. Lewis secured another partner. Ed Wynn went on to bigger things. 1914: Fields and Lewis were still doing the Misery of the Hansom Cab. 1942: John Charles Lewis, Draft registration, dob August 13, 1880, Brooklyn New York staying at the Gary Hotel in Gary Indiana. Not employed. Michael Coffey was born in Count Cork, Irland circa 1838 and immigrated with his parents, James and Eliza, when he was about 5. The family settled in Red Hook Point. Coffey got a job in the Brooklyn Navy Yard as a ships carpenter where he worked side by side with Ned Harrigan, the famous vaudeville actor and comedian. He joined the Navy in the Civil War: There are several one year enlistments that vary slightly as to hir and eye color and height. March 7, 1863 - 1 term, general service, born Ireland, age 23, no occupation, grey eyes , florid completion 5 feet 4 inches. After the war he returned to Brooklyn were he became active in local politics. He rose through the ranks first being elected as Alderman in 1867. In 1874 he was elected to state assemblyman. In 1892 he was a member of the Board of Alderman and was president of that body in 1892 and 1893. He was elected to the state senate in 1893 and served there for 7 years. He went into the contracting business and build docks. His home at the time of his death in 1907 was 42 4th Place, Brooklyn. He left two sons and two daughters. 1900: 4th Place, Coffey, Michael, 1841, married 21 years 8 children 5 living, immigrated 1846, senator, Mary wife, age 49, born NY, Joseph son 20, college, Florence 17, James 16 Marie 12, servant. Michael Coffey died in Long Island College Hospital of cancer a few weeks after surgery. Coffey Park and Coffey Street were named for him. Ned Harrigan was born on the Lower East Side of New York in 1844. His father, William, was a ship's caulker. Ned Harrigan was an actor, playwright, composer and vaudevillian. He formed a very successful partnership with Tony Hart. George M. Cohan wrote the song Harrigan in his honor. Before his career in the theater took off he worked as a ship's caulker, like his father. Some say he worked in Brooklyn - Some say he worked in the Burtis ship yards. The Burtis Ship Yard was originally located in Manhattan but moved circa 1850 to the foot of Conover Street in Red Hook, Brooklyn. Ned Harrigan lived at 310 Park Place Brooklyn from 1895-1908. He died of heart desease. He had quit the stage in 1909, due to illness. The Kassenbrock brothers, Walter and Vincent, who grew up in Red Hook Point, became teachers. The moved to Bay Ridge. PS. 183 at 8601 Ridge Boulevard in Bay Ridge was named for Walter Kasssenbrock. Peter C Cornell born in 1803 was a prominent businessman. He served on several boards, including the Brooklyn Gas Company, The Union Ferry Company, Brooklyn Hospital and Packer Institute. He was the son of John Cornell and Sarah Cortelyou. He lived for a time in a mansion at 222 Columbia street (now gone). PETER CORTELYOU CORNELL, manufacturer, born in Red Hook, on Long Island, N. Y., in 1803, died in the city of Brooklyn, May 5, 1885. He was a son of John Cornell, proprietor of a large flour mill. The family were of English and Dutch pedigree, the Cornells tracing their line to the Cornewells, who ranked among the landed gentry of England saveral centuries ago. Thomas Cornell, founder of the family here, received a grant of Cornell's Neck from Governor Kieft, in 1646. Peter entered business life at an early age, and promoted a great variety of enterprises. He was for many years prosperously engaged in the manufacture of gunpowder, as president of The Hazard Powder Co. on Wall street. He also aided in the establishment of local gas works, ferry lines, banks, and white lead works in Brooklyn. His wife was Elizabeth Bunce. They had no children. The Cornell Family: Whitehead Cornell was born in Queens in 1731. He came to Brooklyn mid 1700s and married Margaret Seabring whose family had a farm between the East River and the Gowanus Creek - Later the location of the Atlantic Docks (Approximately bounded by Degraw and Harrison between Court street and the East River, and Hamilton avenue, Gowanus Creak and Warren street.). Over the years Whitehead Cornell increased his holdings. He divided his property between his three sons: John, Isaac and William. John inherited sixty acres which included the old Seabring mill. John Cornell born 1753 in Hempstead married Sarah Cortelyou Conradi (widow of Charles Conradi). John died in 1820. They lived in Red Hook and owned a large tract of land there. They had: Sarah, George, Catherine, Margaret, Ann, Whitehead, Simon, George Lecky, Agnes, John, Peter, Isaac, Samuel and Mary. 1854: Hazard Powder Company A. G. Hazard, Peter C. Cornell, A. H. Bullock, George L Cornell, Andrew E. Douglass, T. Thompkins, Joseph Thompkins, and Charles Peterson, incorporated to form Hazard Powder company, manufacturers of gunpowder and other things. They were located in Enfiled in Hartford county Conn. INCORPORATING THE HAZARD POWDER COMPANY. Resolved by this Assembly, Sec. 1. That A. G. Hazard, Peter C. Cornell, A. H. Bullock, George L. Cornell, Andrew E. Douglass, T. Thompkins, Joseph Thompkins and Charles Peterson, with all others who are or snall hereafter become associated with them, be and they hereby are, with their successors and assigns, made and established a body politic and corporate, by the name of the Hazard Powder Company, to be located at Enfield, in Hartford county, for the purpose of manufacturing all kinds of gunpowder, and manufacturing machinery, grinding grain, and manufacturing other articles in the most advantageous manner, and for the purpose of trade. And by that name they and their successors and assigns shall be and they are hereby authorized to purchase, take, hold, occupy, possess and enjoy, to them, their successors and assigns, any goods, chattels and effects of whatever kind they may be, the better to enable them to carry on such business in a profitable manner; also to purchase, take, hold, occupy and enjoy such lands, tenements or hereditaments, as shall be necessary for the accomplishment of the purposes of the corporation, and the same or any part thereof to sell, lease and dispose of at pleasure, or to take a lease or leases of any such land and real estate for a term or term of years; also to sue and be sued, plead and be impleaded, defend and be defended, answer and be answered to in all courts of record or elsewhere. And said corporation may have and use a common seal, which they may alter at pleasure. In the 1860s Peter Cornell, gunpowder manufacturer, was listed at 162 Columbia street. "Proceeding along the Newtown turnpike, on the south side was the dwelling of William Cornell (son of old Whitehead Cornell) who owned a valuable farm lying east of the tollbridge, and which included a part of Fort Greene. He was a very jovial man, fond of good company, and was the agent of Dupont, the famous gunpowder manufacturer, for the sale of his powder in New York. When Fort Greene was constructed on Cornell's farm during the war of 1812, the government erected two powderhouses on the hill, which Cornell subsequently used for the storage of Dupont's powder. For several years powder was transported from these powder houses to New York, in open wagons, merely covered over with blankets or carpets. After the incorporation of the village, however, in 1816, the public attention began to be called to the great danger attached to this way of doing things, and finally the authorities broke up the practice. Beyond Uncle Billy's house, on both sides of the Newtown turnpike, to the town line between Brooklyn and Bushwick, there were only some ten houses, occupied by farmers, milkmen and gardeners." 1880: Columbia Heights: Peter C. Cornell	76, powder manufacturer Elizabeth Cornell	70 Amy Blatchford	22, visitor, Thos. Mc Laughlin	35 James J. Burns	40, servant, Joanna O Niell	40, servant, Ellen Mc Carty	41, servant. An Old and Respected Citizen Passing Away. His Life and Public Services - President of the Brooklyn City Hospital Managerial Board and Largely Interested in Other Institutions - The Career of a Representative Brooklynite. Mr. Peter C. CORNELL, an old resident of the First Ward, is dying at his residence of 222 Columbia Heights. Mr. CORNELL was born in Brooklyn 84 years ago and has lived here since. His father was said to have been a Hessian officer who settled in South Brooklyn after the Revolution and ran a tidewater grist mill in Gowanus for years. Young CORNELL was educated at the public schools of the city and became interested in the manufacture of gunpowder while still a young man. When the Brooklyn Gas Light company was organized in 1831, Mr. CORNELL was elected a director in that institution, and continued to serve it in the same capacity until he was stricken down. His 34 years' connection with the gas company is almost rivaled by his long service in the directorate of the Union Ferry Company. He took hold in that body when it was organized and has not relinquished it. The defunct Atlantic Bank also had Mr. CORNELL for one of its directors, but he never attended to that part of his business as much as he could wish. He is a stockholder in the Nassau Bank and at one time was very efficient in directing its affairs. His charities were many and he followed the scriptural injunction in bestowing them. The Brooklyn City Hospital was lucky in securing his cooperation in the work and his services were of such a character that he was selected its president a few years since and still continues to hold the position. One of Mr. CORNELL'S most intimate friends was Mr. Charles E. BULL, of the Brooklyn Gas Light Company. It was said this afternoon that Mr. CORNELL was in a precarious condition, but there is a possibility of his living a few days longer. Grace Church corner of Hicks and Grace Court $5,000 towards sustaining the chapel. Brooklyn Hospital on Raymond street, $5,000. The Church Charity foundation of Long Island founded in 1851 $5,000. The Missionary Society of the Protestant Episcopal Church $5,000. Miss Amy Blackford "now residing in my family" $2,000. The children of the late, Benjamin K True $2,000. His wife, Elizabeth, as long as she remained a widow the residence at 222 Columbia Heights including furniture, plate, pictures etc. - the use of the stables at 133 and 135 Columbia Heights - horses, carriages, harness etc. - his executors to maintain the property in good order and to pay insurance and taxes - On the death or remarriage of his wife "shall fall into and form a part of my residuary estate"
Everything else in his estate, real and personal, was to go to his Executors and Trustees to collect the rents, interests etc. in trust for his wife in her widowhood and others as follows:. Elizabeth his wife, annual sum of $6,000 in equal monthly installments as long as she remained a widow. To his sister, Catherine Cornell, $1,000 in quarterly installments as long as she lived. To his brother, Isaac, $1,000 in quarterly installments as long as she lived. To his brother Samuel, $1,000 in quarterly installments as long as she lived. To Mrs. Juliette Cornell, widow of his late brother, Whitehead, $1,000 in quarterly installments as long as she lived. To Mrs. Ellen H. Tompkins, daughter of his late brother, John S. Cornell, $1,000 in quarterly installments as long as she lived. At the death or remarriage of his wife, the residue of his estate, real and personal, was to take care of the obligation to those stated above and the rest was to be divided in fifths and assigned to his various nieces and nephews. "The provision in his my will in favor of My wife is IN LIEU OF DOWER, and is to be received by her in lieu of all right of dower or other claim that she can or may have at the time of my decease in my Estate, real and personal"
He requested to be buried in Greenwood Cemetery in his mother's four lots and Whitehead J. Cornell's one lot - as the burial place for his and his wife "forever". *This must represent a reburial of these people from another cemetery. Whitehead Cornell who was born March 12, 1731 at Hempstead died February 5, 1810 in Brooklyn and was buried St. Ann's Churchyard. His boady was removed to the family vault in Greenwood. The Moran family were the founders of Moran Towing, one of the largest towing operations in the world. Frank Fogarty (1878-1925) "The Dublin Minstrel"
Frank Fogarty was one of the most popular entertainers in vaudeville in the years leading up to World War I. He started his routine with a song and then moved into a monologue often ending his act with a recitation. He is credited with the invention of a cocktail called "The Last Word" composed of equal parts of gin, lime juice, green Chartreuse and maraschino liqueur. Frank Fogarty lived and grew up on Warren street. Frank Fogarty played the Brooklyn charity events for years. He broke into vaudeville in a big way in 1911 when he performed at the Orpheum in Brooklyn. He won the New York Morning Telegraph contest for the most popular performer in vaudeville in 1912. He was written about in newspapers all over the country in the years before WWI. 1925: Frank Fogarty died in Brooklyn April 5, 1925 of pneumonia. He left a widow, Grace Edmond Fogarty and a son Frank Jr. A native of the Red Hook section of Brooklyn, he had gone to public schools, and graduated St. Francis College on Butler street. He was on the stage for 25 years when he decided he had had enough and was "tired of living out of a trunk". In 1918 he became secretary to the President of Borough Hall, Edward Riegelmann. Frank Fogarty senior was secretary to the Borough President for the last seven years of his life. In August 2015 Scott Prendergast wrote to say he came across the tombstone of Frank Fogarty "The Dublin Minstrel" in Holy Cross cemetery. Fifteen hundred people crowded into St. Teresa's Roman Catholic Church on Classon ave. Many had to be truned away because there was no room. The funeral was attended by celebrities, public figures, politicians, actors, actresses, ball player etc from all over. 1936 Grace E. Fogarty ex-stage star and widow of Frank J. Fogarty died in Bellevue Hospital after a three week illness. She was known as Grace Edmound - a comedienne and singer. She left a son Frank J. Fogarty Jr. Some of Frank Fogarty's jokes are available online and they are pretty bad. Must have been in the delivery. Alphonse Capone was born at 95 Navy street, and baptized at St. Michael the Archangel Church at the corner of Lawrence and Tillary streets. He attended PS 133 at 610 Baltic street near 4th avenue. Al Capone met his future wife, Mary (Mae) Coughlin, the daughter of Michael Coughlin and and Bridget Gorman, at a social club on Carroll street. She was baptized at St. Mary Star of the Sea on court street. They married 30 December 1981 at St. Mary Star of the Sea. The had a son, Albert Francis Capone born December 6, 1918 several weeks before the marriage. He was an only child. Mary family lived at 113 3rd Place. Capone is said to have lived in Red Hook Gardens at Van brunt and Beard streets before his move to Chicago in 1921. I cannot find any proof of this. 1920: Death of Gabriele Capone of a heart attack in Brooklyn. Note: 39 Garfield place where the family was in 1910 and 1920 is between 4th and 5th avenues. 69 Park Avenue (off Navy street) where the family moved shortly after the birth of Al is near Commodore Barry Park. "He received the famous scars on his left cheek by being bayoneted in the Argonne, hit with shrapnel at St. Mihiel and neglecting to duck a beer mug in the Red Hook section of Brooklyn." Richard Joseph "Peg Leg" Lonergan was born January 13, 1900. On Christmas 1925 he died in a gangland shooting. The Irish gangs he belonged to controlled the northern part of the Brooklyn waterfront near the Brooklyn Bridge. 1908: The Lonergans were in Brooklyn by the birth of Patricia in 1908. 1917-18: Richard Joseph Lonergan dob 13 January 1900, bicycle trade, 113 Johnson street, Brooklyn, place of work, 259 Bridge street, Brooklyn mother, Mary, medium hight, medium build, gray eyes, red hair, right leg artificial (259 Bridge street and 113 Johnson street are near Tillary Street). 1918: In November Richard Lonergan age 13 of 131 Johnson street, was acquitted of shooting a policeman in a melee "that wound up a party in honor of a drafted man on lower Henry street" the pervious August. 1920: The court gave permission for the withdrawal of $200 for a new artificial leg for Richard Lonergan aged 14 who got a settlement form the Brooklyn Heights Railroad Company in 1910. 1923: Richard "Peg Leg" Lonergan of 30 South street was arrested in a raid of an all night bungalow party at Coney Island. A quantity of liquor was seized. Mrs. Lonergan, the mother of Richard, had been recently acquitted of the murder of her husband. A brother William age 13 was also arrested at the bungalow party. William had testified against his mother at her trial. 1923: Richard Lonergan's sister Anna married the Gangster William "Wild Bill" Lovett who was murdered in Brooklyn on October 30, 1923. Richard Lonergan was a member of the Bill Lovett gang when he was sentenced to the workhouse for 3 months on disorderly conduct charges. 1923: Mrs. Lonergan of 113 Johnson street, shot her husband John in his bicycle and motorcycle repair shop on Bridge street May 16 1923. She said her husband had beaten her repeatedly for 30 years. She said her husband had a gun. They argued and she got the gun away from him and shot him. She said she married at age 15 and had 14 children of whom 8 died. She stated that she had to work most of her married life in addition to tending the house and children. Her son William age 14, "red haired and snubbed nosed" claimed his mother had entered the shopwith something shiny in her hand. He saw his father turned towards the wall, heard a shot and saw his father fall. She was acquitted. 1924: Peg Leg Lonergan age 26 of 261 Bridge street, was sent to prison for 6 months for possession of 61 loaded cartridges. He was arrested for disorderly conduct. a companion arrested at the same time was charged with violating the Sullivan law. 1925: Richard Longergan was killed in a shot out on the night of December 25, 1925. Capone was said to have been involved in the killings. Anna Lonergan, the sister of Richard was first married to Bill Lovett who died in the 1925 Christmas shootout. She then married Matthew Martin who was convicted of having a fully loaded automatic in his pocket when he was returning from the wake of Richard "Peg Leg" Lonergan.